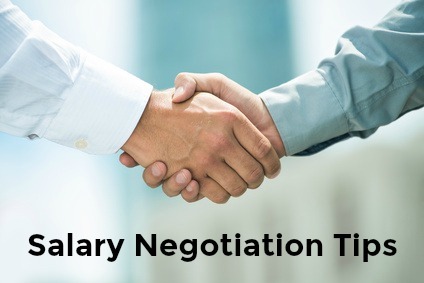 10 top salary negotiation tips to help you negotiate your job offer. Prepare your negotiation strategy and get the job offer you want. Ideally you should only enter into negotiation once you have had a formal job offer and the employer is convinced of your worth. Your power to negotiate is much greater when the employer has decided you are the best candidate for the position. However be prepared to respond to the salary question in the initial interview stages by remaining as non-committal as possible and stating a wide range. Use the guide to handling the salary question in your interview. If you are asked to state a salary on the application form respond with the words "open" or "competitive". Try to set up your compensation discussion with this person directly. Don't waste time negotiating your job offer with an employee who has not got the authority to make any changes or improvements on the offer. Know exactly what your salary requirements are before you enter salary negotiations. Find out how to work out your monthly income requirements with this expenses calculator. Salary negotiation tips include been clear in your own mind about what you want to walk away with from the negotiations. The greatest tool in any negotiation is information. Find out your competitive market value by using the resources at salary negotiations and know exactly what your skills are worth in the current job market. Consider the economic, geographic and industry factors of the job to determine your fair market value. Have this data ready for use during the negotiations. You should support your salary request with documentation including current market salary data, your performance evaluations and letters of recommendation. What are you worth to this specific employer? Consider criteria such as the supply and demand ratio for your skills in this industry and the number of suitable candidates the company has interviewed. This information provides you with an understanding of how much negotiating power you really have. It is important to distinguish between your market value and your company value. Focus on your value and not your needs. Structure your salary negotiations around the value you bring to the position and company and avoid mentioning what you need or feel you deserve to be paid. Employers are generally not interested in your monthly expenses. Base your negotiations on your solid research into your market value and company value. Weigh the financial value of the benefits offered as part of your gross income. Benefits can add up to 30 percent of the total compensation. Find out the steps to take to put a dollar value on the entire package at negotiating a job offer. Prioritize your interests and determine which of the benefits you are willing to negotiate. Start with negotiating your basic salary first and then move on to the benefits, one element at a time. Just remember you usually cannot try to negotiate the entire job offer. Key to salary negotiation tips is to choose the elements you want to negotiate carefully and make sure you have solid research to back up your proposal. Start the actual negotiations by thanking the employer for the job offer and restating your interest in the position and company. Begin at the top of your pre-determined salary range. Research often shows a strong link between people's aspirations and the outcome of the negotiations. Aim high but be realistic. Remember that a negotiation is about listening to each other and respecting the needs of both parties. Avoid demands, threats and defensive behavior. The outcome should benefit both parties. Remind the employer of your value to them and continue to express enthusiasm and commitment for the job and company. This is the end of negotiations and you need to decide if this final offer is acceptable or not. Know when to stop and take the best offer on the table. To carry on beyond this point could cause ill-feeling and damage any future relationship. A legitimate offer should be given in writing and if the employer is reluctant to do this it is a major red flag that there is something wrong. It is important to keep in mind that the majority of job offers are negotiable but only a small percentage of job candidates actually enter into negotiation. You don't have to be an expert negotiator to get the job offer you want. Follow these basic salary negotiation tips to prepare your strategy for job offer negotiations and ensure a successful outcome.